If you want to dress up as a witch this Halloween, you must not miss it. and it looks great too. The stick is plastic to make carrying easy, but it's perfectly sculpted with the texture and crooked shape of a real broomstick. The straws are genuine natural broom straws, and the thick twine holding the straws to the stick is natural and real too. The overall length of the broom is about 42 inches -- big enough to be realistic, but not so big that it's hard to carry, whether you've got a trick-or-treat sack in the other hand or a cocktail. It's also convenient to hang up the broom since there is a small hole through the rope on the handle. So whether it's for yourself or for a favorite witch in your life, order today. This is the Ferrari of witch's brooms! This UNOMOR product is sold with a money-back guarantee. If you're dissatisfied with your purchase for any reason, contact us for an immediate replacement or refund. THE PERFECT FINISH TO ANY WITCH COSTUME. If you want to dress up as a witch this Halloween, you must not miss it. This completely realistic-looking witch's broom is sure to make your costume a hit. SUITABLE SIZE AND WEIGHT. The broom is about 42" long -- long enough so it doesn't look like a cheap toy, but not so big that it's awkward for a young witch to carry. Light in weight, too. REALISTIC & EYE-CATCHING LOOK. The crooked stick is plastic to save weight but strong and real-looking. The straws are real natural broom straws, firmly bound to the stick with natural twine. FOR HALLOWEEN AND MORE. 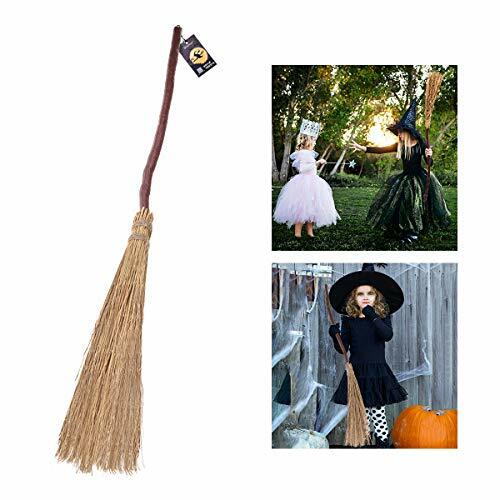 Obviously a must-have accessory for any Halloween witch, young or old. Also great for Wizard of Oz or fairy tale parties or plays, part of a Halloween decoration, etc.